Andrew Bell with his 29lb 12oz pike. Pike fishing is at last beginning to improve for local anglers. On the fen drains the likes of the Forty Foot and Twenty Foot Drains have started to produce and the River Nene has also hit form with quite a few double-figure pike being taken. Ashley Hill with a fine pike taken from the fenland drains. Peterborough DAA bailiff Andrew Bell spends a lot of time on the river ensuring all is well but at this time of year with less activity he often has a couple of hours wandering the River Nene above the city centre with a spinning rod. It often produces a few small fish but on his latest trip out he caught a fine 29lb 12oz pike taken on a faithful old Ondex spinner. As you can imagine it put up an extremely hard and powerful fight before Bell eventually put it to the scales to set a new personal best for him. It was also one of the biggest pike taken from the river for some time. Let me assure you all that it was returned safely and quickly to the water after a short photo session as I know it does upset a few anglers to see fish being held up for photos for too long. Over on the fenland drains Ashley Hill has had some very difficult days recently, but was rewarded with several good fish over the holiday period all taken on small dead baits. 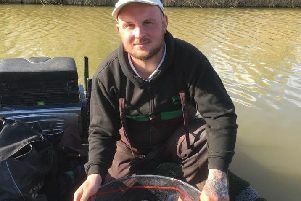 The Twenty Foot drain at Beggars Bridge has been fishing well of late and the form was reflected in the cracking weights recorded in the latest Whittlesey AA club match. First place went to Mel Saggers next to the road bridge catching roach from the start on the pole with pinkie. His catch of 14lb 11oz also included a few decent perch taken late on. Runner-up was Brian Best on the other side of the road bridge catching roach and rudd on the pole for a weight of 14lb 2oz. Jeff Tuttlebee came in third. He fished near to the rail bridge starting on the pole and switching to the waggler to finish with 12lb 3oz. Frank Bevilacqua came fourth with 11lb 12oz. The Twenty Foot Drain also fished well over the new year period in the March AC Open, although most of the better weights came from the few pegs close to the bridge. Top rod with a very impressive 28lb 6oz was Alex Bates, who caught big roach and a few rudd on the long pole. Second was Bob Fitzjohn with a fine net of quality rudd taken on bronze and red maggot followed by John Taylor with close to 500 small fish on the whip for 24lb 10oz. Andrew Wilding took first place on Factory Bank with 14lb 14oz of roach taken on the whip close in. Runner-up with 13lb 13oz was Keith Rayment followed by Harry Young on 10lb 12oz. A thin layer of ice couldn’t stop the club regulars in the next match although weights did drop. Young topped the field with 7lb 8½oz from peg five followed by Ivan Steels on 6lb 12oz and Ken Taylor with 6lb 8oz. The last match on the same venue on New Year’s Day saw Wilding back on top with 10lb 1oz of small fish from peg six. Young rounded off a good Christmas series with 8lb 5oz to give him the runner-up spot, then came Dave Chamberlin on 4lb 13oz. On the same day the club also ran a pike match at Ramsey St Mary’s which saw lots of fish taken. Leading the way with three good fish for 29lb 12oz was Terry Jolly. His best fish went to the scales at 18lb 6oz. Second with four small pike was Bob Tyrkot, who weighed in at 20lb 14oz. Paul Keeping took third place with three pike for 11lb 12oz. Lake Ross : 1 Ian Frith 89lb 10oz; 2 Matt Arnold 85lb 4oz; 3= Andrew Albright and Dave Mason 52lb. River Glen: 1 John Bates 7lb 1oz; 2 Steve Hemmingray 6lb 4oz; 3 John Taylor 5lb 5oz. Webb’s AC, Horseshoe Pool, Float Fish Farm: 1 Mick Linnell 23lb 7oz; 2 Peter Telzewski 15lb 5oz; 3 Gordon Harmer 14lb 15oz.